Jinjoo Cho, 26, of South Korea has won first prize in the 2014 International Violin Competition of Indianapolis. Laureates were announced Saturday following the last Finals concert with the Indianapolis Symphony at Hilbert Circle Theater. 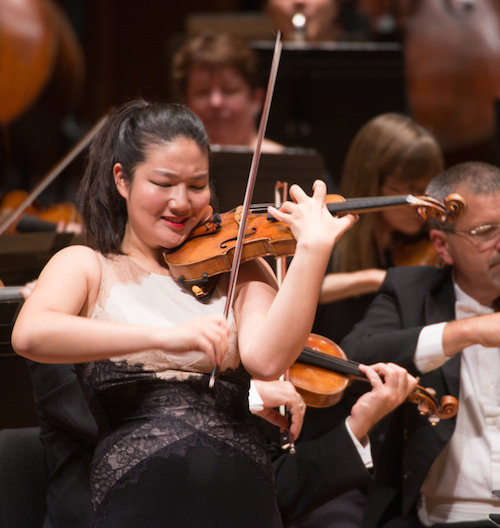 Gold medalist Jinjoo Cho is a graduate of the Cleveland Institute of Music and attended Curtis Institute. Her current teacher is Jaime Laredo and she has studied also with Paul Kantor, Joseph Silverstein and Pamela Frank. Previously she won first prize in the Montreal International Music Competition, Buenos Aires International Violin Competition, Schoenfeld International String Competition and the Stulberg International String Competition. Silver medalist Tessa Lark has studied with Miriam Fried, Lucy Chapman and Kurt Sassmannshaus. In 2012 she won the Naumburg International Violin Award and in 2014 she received a career grant from the Leonore Annenberg Fellowship Fun for the Performing and Visual Arts. Bronze medalist Ji Young Lim studies with Nam Yun Kim at the Korea National University of Arts and was a prizewinner at the 2013 Montreal International Music Competition, first prize at the Euroasia International Competition and third prize at the 2011 Henri Marteau Competition. Jury members included Jaime Laredo (Jury President), Ellen Taaffe Zwilich, Dong-Suk Kang, Boris Kuschnir, Cho-Liang Lin, Philip Setzer, Dmitry Sitkovetsky and Kyoko Takezawa. Jury member Miriam Fried was asked not to vote because three of the six finalists were current or former students of hers. Jinjoo Cho has been one of my favorite young violinists since her Montreal Competition win in 2006. Congratulations to her; I'm so delighted at her win, and I hope the competition brings her all the recognition she so richly deserves!